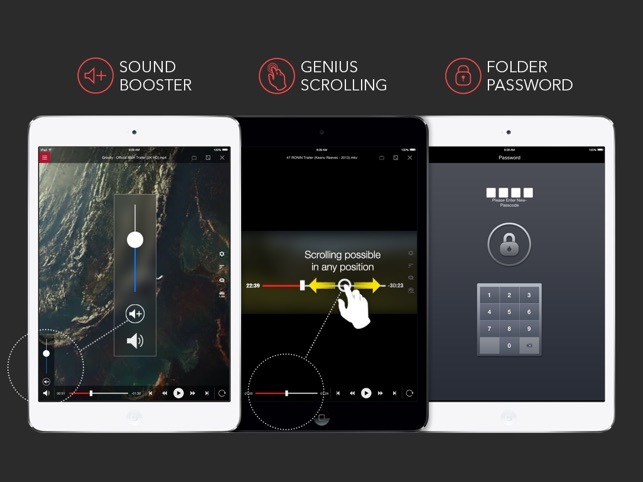 Do you enjoy watching videos on your iPad? 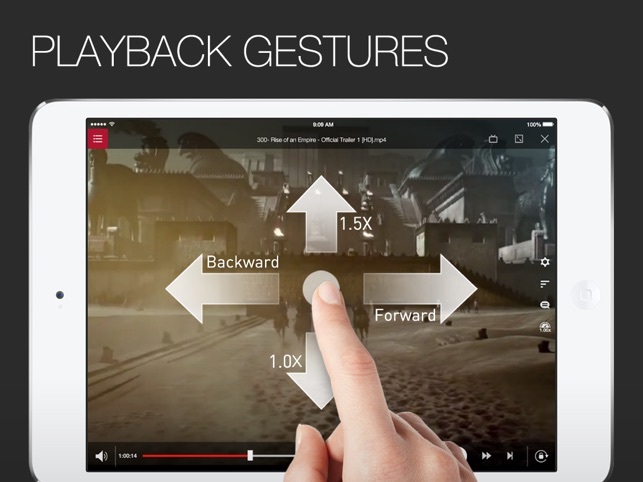 Do you hate not being able to because your iPad cannot support the video format? Or do you hate the inconvenient and time-consuming hassle of trying to convert video formats to fit into one that your iPad can support? This is why the AVPlayerHD was created. 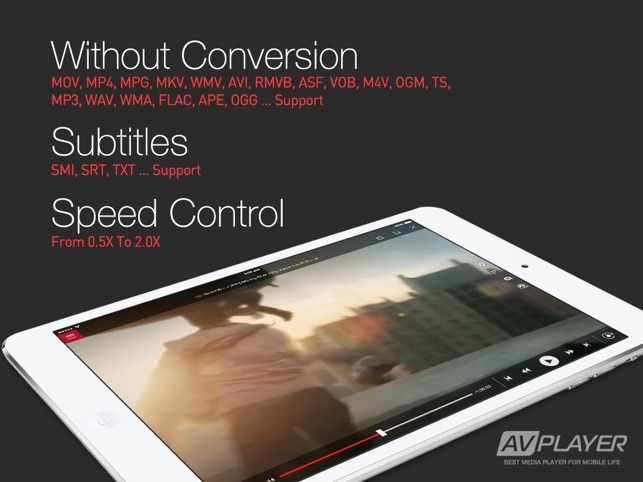 The AVPlayerHD can play almost any computer video file format such as AVI, Xvid, WMV and much more clearly and effortlessly. No converting hassles. Just copy files via USB and just drag and drop into the AVPlayer’s Media Explorer. 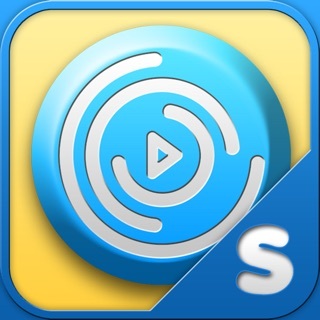 The AVPlayerHD can also support external subtitle files such as SMI and SRT. 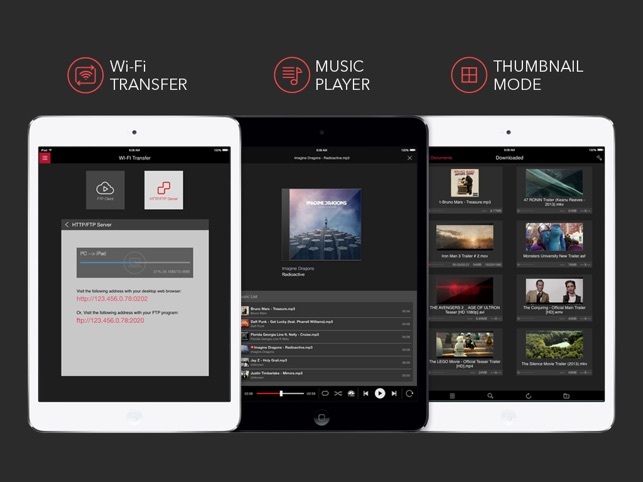 So if you enjoy watching videos on your iPad, then the AVPlayerHD is an absolute necessity. - XVID,AVI,WMV,RMVB,ASF,H264,MKV… most of all movie file formats. - High quality video clips of 720P (1280 x 720) or more are recommended for MP4 format. - MP4, MOV, M4V formats that QuickTime supports can be played up to 1080P by using H/W Decoder but, Post Processing function isn’t provided. 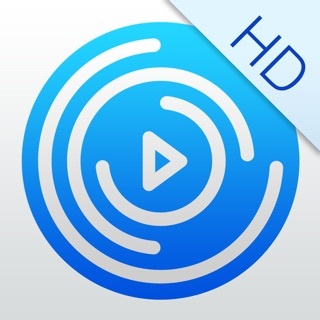 - Hybrid decoding mode is added and now it is able to play high resolution videos by using hardware accelerator feature embedded in iPhone/iPad even for mkv or avi in h264. Also battery use time has extended. - Application may crash in iPhone 3GS / iPod Touch due to heavy use of memory in Hybrid decoding. Try turning off all application running in background and reboot the device by holding down sleep mode button for long time. - If screen shakes it means hardware decoding is not supported. Try turning off hybrid decoding. - When the file formats are available for MKV or AVI the player supports hardware decoding. - If you cannot choose audio in mp4 or avi, change the extension to mkv temporarily and chosen audio channel will be applied. 3. The optimal speed when advancing its playing speed can differ depending on the way it’s compressed and the size. Video clips of XVID (AVI) 720 x 480 can be fast played up to 1.3-1.5 times faster than normal. Fixed the problem that the Inbox doesn't appear after "share and copy to ..." on iOS 11. Fixed the bug AVPlayerHD doesn't start streaming when launched by URL scheme from other Apps such as "FileBrowser". Уважаемые разработчики, почему я должен дважды платить за скачивание одного и того же приложения???? Скачал на iPad-заплатил, хотел скачать на iPhone- опять просят денег!!!!!! the best program for video ever. very good quality and very human oriented interface. Требуется iOS 9.0 или более поздняя версия. Совместимо с iPad.